On 16 July 1861, the largest army ever assembled on the North American continent up to that time marched from the vicinity of Washington, D.C., toward Manassas Junction, thirty miles to the southwest. Commanded by newly promoted Brig. 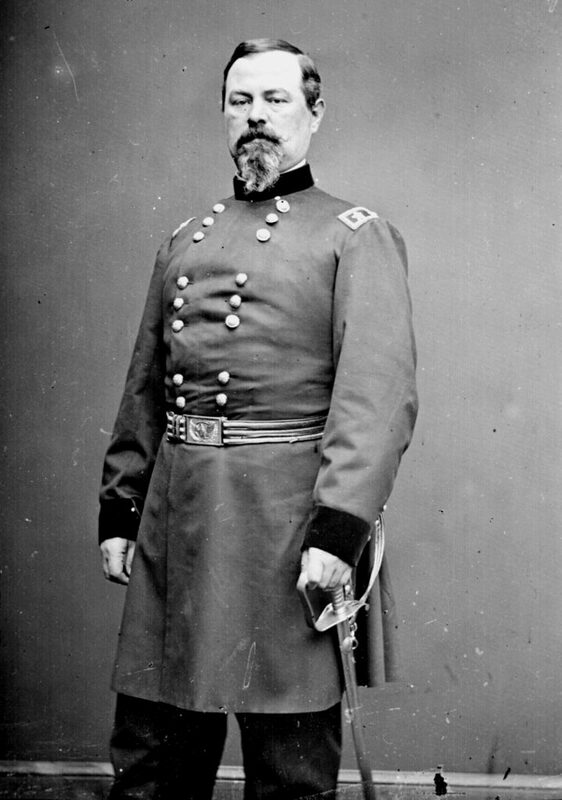 Gen. Irvin McDowell, the Union force consisted of partly trained militia with ninety-day enlistments (almost untrained volunteers) and three newly organized battalions of Regulars. Many soldiers, unaccustomed to military discipline or road marches, left the ranks to obtain water, gather blackberries, or simply to rest as the march progressed. The first major battle of the Civil War was fought in Virginia, near the Manassas, Virginia railway junction, after which the battle is called (or First Bull Run, named after the flowing stream on the battlefield, if of the Union persuasion). The armies in this first battle were not very large by later Civil War standards. The Federal forces under Brigadier General Irvin McDowell were organized into four divisions (five, if one includes Runyan&apos;s division), of about 30,000 men. Soon after the first conflict between the authorities of the Federal Union and those of the Confederate States had occurred in Charleston Harbor, by the bombardment of Fort Sumter,-which, beginning at 4:30 A. M. on the 12th of April 1861, forced that surrender of that fortress within thirty hours thereafter into my hands, -I was called to Richmond, which by that time had become the Confederate seat of Government, and was directed to "assume command of the Confederate troops on the Alexandria line." Arriving at Manassas Junction, I took command on the 2d of June, forty-nine days after the evacuation of Fort Sumter. In July 1861 the northern newspapers pressured President Lincoln to bring a quick end to the rebellion of the southern states. Adding to the strain was Lincoln&apos;s awareness that the ninety-day enlistments of the recruits who had responded to his call to arms after the attack on Fort Sumter were rapidly coming to an end. Something had to be done, and soon. Lincoln pressed for action. Despite his hesitancy that his troops were not yet adequately trained, General Irvin McDowell proposed a plan. He would march his army of 35,000, currently bivouacked around Washington, thirty miles south and attack the Confederate forces defending the vital railroad junction at Manassas, Virginia. Victory would open the way to the Confederate capital at Richmond. This was the first major land battle of the armies in Virginia. On July 16, 1861, the untried Union army under Brig. Gen. Irvin McDowell marched from Washington against the Confederate army, which was drawn up behind Bull Run beyond Centreville. On the 21st, McDowell crossed at Sudley Ford and attacked the Confederate left flank on Matthews Hill. Fighting raged throughout the day as Confederate forces were driven back to Henry Hill. Late in the afternoon, Confederate reinforcements (one brigade arriving by rail from the Shenandoah Valley) extended and broke the Union right flank. An animated account of the First Battle of Bull Run. Requires Adobe Flash player. The war was still fresh and green, more music and flamboyant uniforms than wounds and missing kin. Crowds cheered on July 16, 1861, as Irwin McDowell&apos;s army marched through the streets of Washington, then across the bridges and into Virginia. Everyone in the capital was confident that the swaggering army would knock the Rebels aside and end the war in a few weeks, if that long. There would be a few artistic wounds, enough for the newspapers to talk about bandaged heroes, but nothing serious. Some civilians packed picnics and followed the army, wanting to see the spectacle of a battle. By early summer of 1861, the war-fevered citizenry of the Union and the newly established Confederacy were clamoring for the fighting to begin. Pressured by public opinion, opposing presidents Jefferson Davis and Abraham Lincoln urged their respective armies to begin offensive operations. In July, 1861, Abraham Lincoln sent Major General Irvin McDowell and the Union Army to take Richmond, the new base the Confederate government. On 21st July McDowell attacked the forces of Pierre T. Beauregard near the stone bridge over Bull Run at Manassas Junction, Virginia. The advance was blocked by Thomas Stonewall Jackson, who was described as standing like a "stone wall" against the enemy. Bull Run, FIRST BATTLE OF: The gathering of Confederate troops at MANASSAS JUNCTION required prompt and vigorous movements for the defense of Washington, D. C. Beauregard was there with the main Confederate army, and Gen. J. E. Johnston was at Winchester, in the Shenandoah Valley, with a large body of troops, with which he might reinforce the former. Gen. Robert Patterson was at Martinsburg with 18,000 Nationals to keep Johnston at Winchester. This was the first major land battle of the armies in Virginia. On July 16, 1861, the untried Union army under Brig. Gen. Irvin McDowell marched from Washington against the Confederate army, which was drawn up behind Bull Run beyond Centreville. On the 21st, McDowell crossed at Sudley Ford and attacked the Confederate left flank on Matthews Hill. Fighting raged throughout the day as Confederate forces were driven back to Henry Hill. On July 21, 1861 the First Battle of Bull Run occurred. It was the first real major conflict of the American Civil War. A Union army, consisting of 28,000 men, commanded by General McDowell, fought 33,000 Confederates under General Beauregard. The Union army, under pressure to crush the rebellion in the South, marched towards Richmond, but met the Confederate forces coming north from Manassas, a Southern base. In the summer of 1861, both sides were extremely confident of a quick and easy victory. President Abraham Lincoln had ignored Scott&apos;s Anaconda Plan and asked only for 90-day enlistments from state militia forces. Southerners, equally optimistic, assured one another that the war would be over by Fall. The Union and Confederate forces met at Manassas, Virginia. Both sides planned to attack the other&apos;s left flank with the majority of their armies. However, the confederates realized quickly the Union army&apos;s plan and moved forces to meet the attack upon their left flank. At the same time, they were able to build up enough troops on the Union right side to overrun that flank leading to a disorderly retreat to the North. The Confederate army did not pursue the fleeing troops. In the summer of 1861, enthusiastic volunteers in colorful uniforms gathered to fight the first major land battle of the war. Confident that their foes would turn and run, neither side anticipated the smoke, din and death of battle. Nearly one year later, both sides met again on the same battlefield with the Confederates winning a solid victory bringing them to the height of their power. Official report of General Joseph E. Johnston regarding the First Battle of Bull Run, submitted October 14, 1861. Official report of General Irvin McDowell regarding the First Battle of Bull Run, submitted August 4, 1861. The First Battle of Bull Run (or First Manassas), the earliest important engagement of the war, was fought on July 21, 1861, between a Union army of about 30,000 under the command of General Irvin McDowell, and a Confederate army of about 22,000 commanded by General Pierre Gustave Toutant Beauregard. Detailed information about the armies and units that fought at the First Battle of Bull Run.